There are a few narrative ideas that thread through the perspectives of most artists. For me, as for many creators, hope is one of those threads. Maybe because creating in itself speaks to a form of hope. I'd had this idea in mind for a while, but it took news of my cousin Melodie's plan to create an annual holiday gala to raise funds for researching a cure SMA (Spinal-Muscular Atrophy), the genetic condition that affects her son and my second cousin Taysen to push me into actually creating the three-part set of small encaustic paintings. The main idea centered on the chaotic circumstances and patterns, whether tragic or simply nonsensical, that don't seem to make sense from my small perspective. And I wanted to set that up together with some of the patterns we see in nature which reveal an amazing degree of pattern, logic, design...sometimes, it seems, to no real purpose. I wanted the piece to read left to right, chaotic to peaceful. 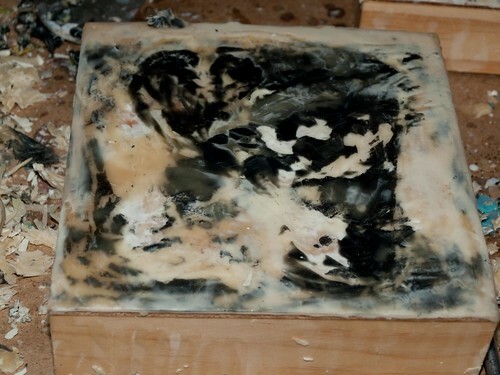 The black is all photo transfers layered with natural beeswax. They are small, 6x6 inch boards. The first painting was still in progress when I took the picture, and I somehow missed getting a close up shot of the finished painting. 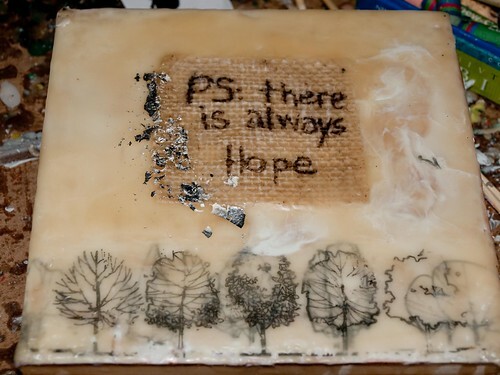 I added several more layers of wax and photo transfers of feathers, which always seem to me to be an element of hope, as well as being a natural pattern. Is it only thanks to Emily Dickinson? 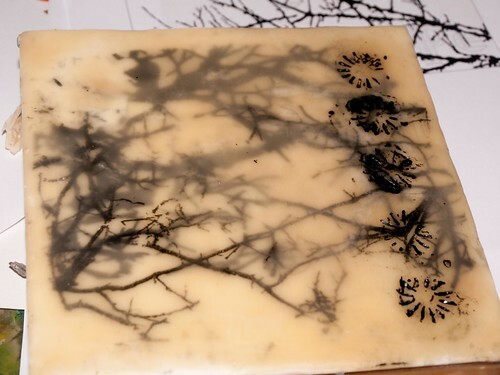 The second painting is layers of photo-transferred branches and imprints stamped into the top layer from the beautiful pattern at the bottom of a poppy seed pod. The heart of my idea rested as it often does in words. Here finally the patterns of nature are captured as designs, not photo-real elements, of layers of architectural drawings of trees in different seasons. and of course, some silver leaf. Somehow the tone changed while uploading the picture. In real life, I don't think they look quite this yellow, but with the natural beeswax there is definitely a golden tint. The left-hand one is particularly indistinguishable, but you can get an idea of the whole set from here. These pieces were donated as a silent auction item at the gala.